On our first day in Sicily, we visited the Piazza Pretoria, a square at the center of the city of Palermo. The square features a large fountain at its center, surrounded by over 15 statues of human figures, animals, and other mythological creatures. 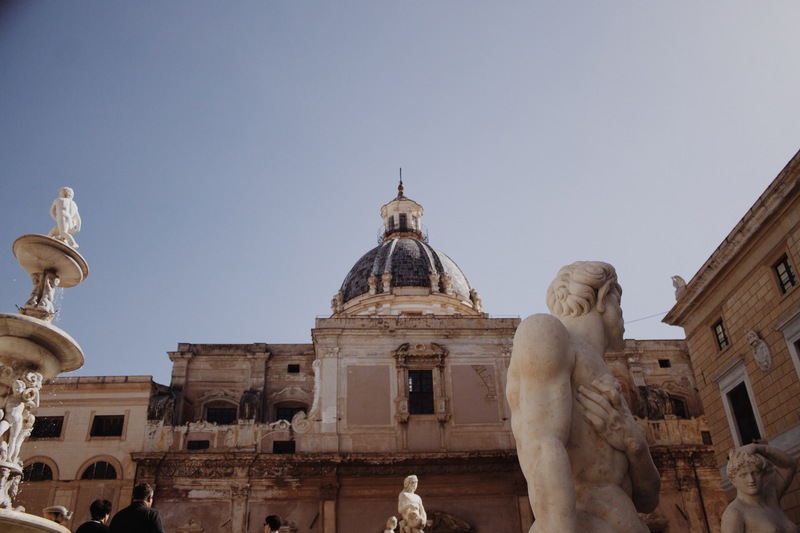 The site has been termed the “Square of Shame”–not only for its naked figures, but also because it was considered a representation of corrupt government influenced by the Spanish Inquisition. Many of the statues were even dismembered by those who were opposed to this significance. Despite the negative connotations surrounding the fountain, I found the piazza to be very charming. There is a striking balance between the space created around the fountain and the volume of the states. A beautiful symmetry exists between the four sets of stairs leading up to the center fountain, which rises up from a large base to a delicate point at the top. The white marble with which the figures are constructed creates a dramatic effect in contrast to the surrounding buildings, one of which is the praetorian palace (town hall).